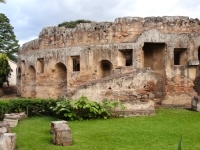 The ruins of the biggest and most remarkable of Antigua's convents, Las Capuchinas, are the best preserved and most beautiful in the city. The convent was founded in 1736 by Spanish nuns and is now a museum dedicated to religious life in colonial times. The nuns who lived here followed a strict daily routine that focused around fasting and praying. Their tiny cells can be found in the walls of the round tower, which has good views from the top. There are also fountains, gardens and several lovely courtyards within the compound.